Kuwait Airways ceases all flights to Beirut, cites security warning that came from the government in Cyprus. 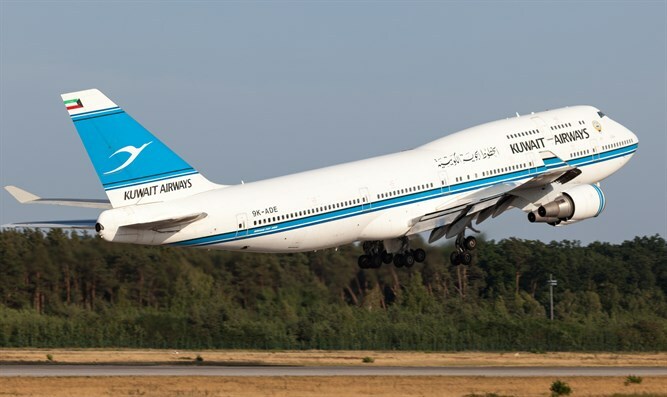 Kuwait Airways, the country’s national carrier, announced on Wednesday night that it will cease all flights to Beirut, Lebanon, starting Thursday. The decision was made in light of a security warning that came from the government in Cyprus, it said, according to a report in Russia Today. The company announced on Twitter that it made a decision to stop all flights bound for Lebanon “on the basis of serious security warnings,” adding that it is aimed at “preserving the safety” of its passengers. No further details were provided on the nature of the security warning, nor is it clear how long the suspension will last, with the company stating that all flights will be terminated “until further notice." The alert warned pilots about the risks of flying, specifically in the eastern Mediterranean and in the Nicosia flight region, noted Russia Today. Tensions have run high in the region since over 150 people were killed in an alleged chemical weapons attack in the city of Douma, east of Damascus, on Saturday night. Since the attack there have been speculations that the U.S., the UK and France could strike in Syria. The Daily Telegraph reported earlier on Wednesday that British Prime Minister Theresa May has ordered British submarines to move within missile range of Syria in readiness for strikes against the Syrian military. A separate report in Sky News said May will convene a special "war cabinet" on Thursday which is expected to be asked to approve a form of British participation in action led by France and the U.S. aimed at Syrian President Bashar Al-Assad's chemical weapons infrastructure. Earlier on Wednesday, U.S. President Donald Trump mocked the Russian government's threat to shoot down any U.S. missile launched at Assad’s forces. "Russia vows to shoot down any and all missiles fired at Syria. Get ready Russia, because they will be coming, nice and new and ‘smart!’ You shouldn’t be partners with a Gas Killing Animal who kills his people and enjoys it!" he tweeted. Despite that tweet, White House press secretary Sarah Huckabee Sanders later told reporters no decision has been made yet on Syria.